iCashTV, an in-store digital advertising network for check cashing and currency exchange offices, is introducing Blue Bite’s mTag NFC platform across the US. The NFC tags will be located next to teller windows at hundreds of locations in New York, New Jersey, Boston, Chicago, Atlanta, Denver, Los Angeles, Milwaukee, Minneapolis, Raleigh-Durham and San Diego from the end of this month. 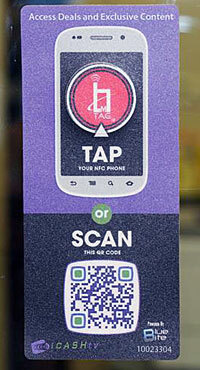 Customers who view a video on an iCashTV screen while visiting a check cashing office will be prompted to either tap the NFC tag or snap a QR code on the mTag decal affixed to teller windows to download content from brands, including music, videos, mobile apps, promotions, coupons, maps, tips and store-specific offers and information.